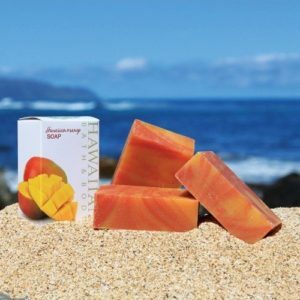 Hawaiian Mango Papaya Soap is the second most popular of Hawaiian Bath & Body’s handcrafted soaps. Hawaiian Bath & Body Mango fragrance & essential oil blend has a light and uplifting exotic scent that speaks of Island Aloha. All the color in the soap comes from natural plant extracts. An infusion of organic flower and herbs– Turmeric, Chamomile, and Calendula. 3.2oz. Scented with Hawaiian Bath & Body Mango fragrance blend.